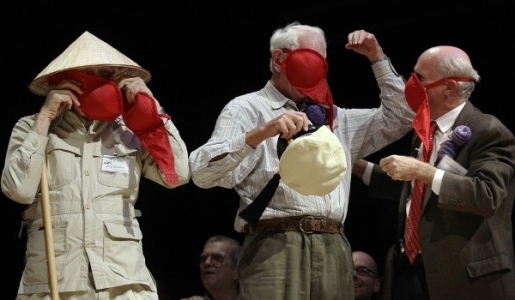 How do you get three Nobel Prize-winning scientists to put bras on their faces? Well, you make them presenters at the 2010 Ig Nobel Prize. That’s where Roy Glauber (Physics, 2005), Sheldon Glashow (Physics, 1979), and James Muller (Peace, 1985), were caught modeling one of 2009’s winners, the gas-mask bra. This year’s winners didn’t include as many fun things to try on, but they did include some of the dumbest research and most wasted grand money in the world. The winner of the top prize, for the second time, was the slime mold. The same team who won an award in 2008 picked up a second in 2010 when they used slime molds to plan a revamped Tokyo subway system by tracking how slime molds moved in the most efficient manner to claim the most food. Also among the winners were AIG, who invented an incredible new way to lose all your money; BP, who proved that oil and water do mix; and researchers who concluded that the safest way to walk around in winter is to wear socks on the outside of your shoes to get maximum grip.